Reserve Your Spot in the Zombie Apocalypse Today at Room Escape Adventures! 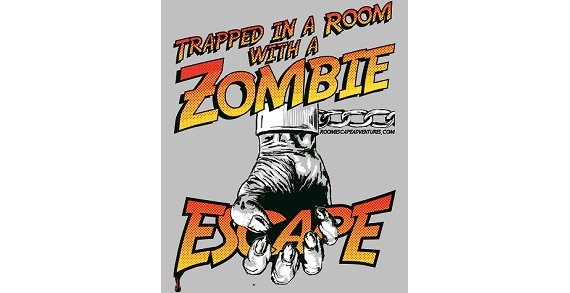 Special Offer: $19 Tickets to Trapped In A Room with A Zombie…A 30% savings! 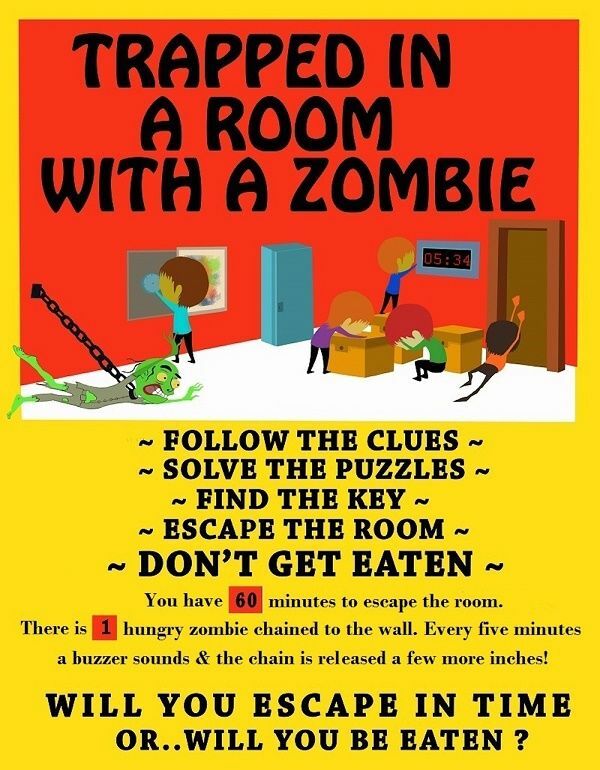 For one hour, up to 12 participants are trapped in a room with a hungry, yet hilarious zombie that’s trying to consume all human brains. Together, the adventurers must untangle puzzles and gather clues hidden throughout the room to find the one key that grants them freedom. Every five minutes, the zombie’s chain grows longer, so participants must act fast to avoid contracting the virus. Will you escape...or be eaten? Great for birthday parties, date night, or family fun! Participants younger than 14 must be accompanied by a paying adult. The Room Escape Adventures series are part reality game show, part real-life video game, and part immersive suspense theater. Each starts with an ingeniously locked room laced with hidden clues and an actor in character whose function is to get the adrenaline in the room flowing faster as participants work against the clock to find the key and escape. Along the way, they'll have to combine their brainpower to answer riddles, open safes, and search the room for hidden compartments. Room Escape Adventures is an interactive theater experience that functions as a team-building activity, as the staff analyzes each group’s communication skills by the end of the session. The session could also be attended for date night, as an outing with family or friends, or for a birthday party. The activities aren't meant to scare, but do pack adrenaline, laughter, and fun into 60 minutes of bonding. Tickets: $28 per ticket plus processing fees; check out the special offer and save!